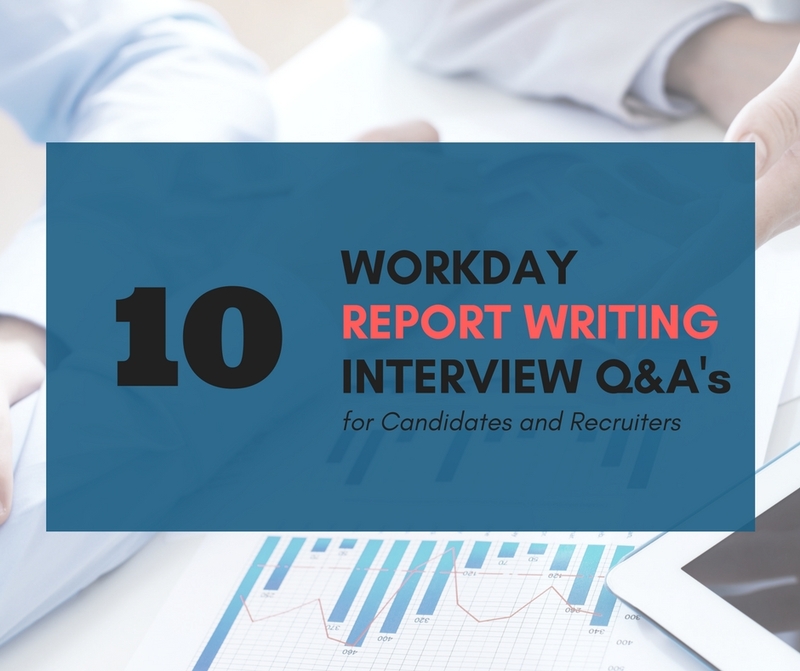 In the second part of our Workday Interview Questions for Candidates and Recruiters series, we are addressing Workday Report Writing. Remember to look into Workday Learning and Workday Community as your primary source for official Workday documentation. Report Writing is an essential skill needed for almost any advanced interaction with Workday, and any Workday Professional (in our opinion) needs to know Report Writing to perform their job duties successfully. Whether your job includes helping a client through an implementation, perform data conversion, configure business processes, configure security, develop integrations, or administer any module in Workday, you need to be able to run and build custom reports. Name two types of Workday Standard Reports and a difference between them. Report Writer Reports and XpressO reports. Report Writer can be copied and customized, but you cannot copy XpressO reports. Which prefix limits a search to reports? What is the relationship between a Business Object and a Data Source? Give an example. The Business Object serves as a template of an entity, and the Data Source is the data selection or group that will create that template. In Workday, one example of a Business Object is ‘X Employee’ and for a Data Source, ‘All Active Employees’ – a report with these two selections should only return active employees within the organization. A scenario outside Workday could be a Business Object called ‘Country’, and a Data Source named ‘All European Countries’ – this non-Workday example should return Spain, Portugal, France, Germany, Italy, etc. Which delivered report can provide the relationship between data source, business object and security groups that have access to those? The “Data Source” Workday delivered report. What are two ways to create a report in Workday? Run the Create Custom Report task. Copy a Workday Standard Report and modify it. What are some of the Report Types in the Workday Report Writer? Simple, Advanced, Composite, Search, Matrix, etc. Name some differences between Simple and Advanced Reports. Simple reports cannot access related Business Objects while Advanced Reports can. Simple reports cannot be shared while Advanced Reports can be shared. Simple reports cannot be RaaS enabled, Advanced Reports can be RaaS enabled. Currency, Boolean, Date, Numeric, Text, 1:1/1:M Object, Self referencing instance. If you share a report with everyone within your organization, will anyone be able to see the same output when running the report with the same input values? Why? No, the output will depend on the security access to the data source of the person who is running the report. What is a Calculated Field? How can you create one? What can you do with it? A Calculated Field is a field created to manipulate existing data. To create a Calculated Field you can run the Create Calculated Field task. Some of the things that you can do with Calculated Fields are: lookup related values, currency conversion, string or text manipulation, evaluate an expression, format a date, etc. Don’t forget to follow us on LinkedIn, Twitter and Facebook to keep up with the latest updates!